Surrender or die is the message beamed at the remaining Iraqi Republican Guard soldiers in trenches around Baghdad. Coalition propaganda is aired 24 hours a day over Information Radio, part of a sophisticated psychological warfare operation aimed at winning the war in Iraq with less fighting, less casualties - and more clever persuasion. With emphasis on the technical aspects, this article is the most comprehensive report published so far of the ongoing Iraqi mission of Information Radio. Information Radio, Radiyo al-Ma'ulumat (sample station identification: ) in Arabic, is a US military Special Operations radio station broadcasting anti-Saddam Hussein messages, which are aimed at weakening his support among the Iraqi people and military. 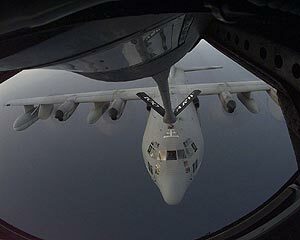 Radio broadcasts are transmitted 24 hours a day from several transmitter sites in the air above Iraq, on the ground in Iraq and on naval vessels in the Persian Gulf and the Gulf of Oman. Until now, these transmitter locations have remained unknown. The programs however are well-known - or at least they should be - because that is the purpose of the mission. Each program normally lasts about an hour and contains an introduction, combinations of regional and Western music and an information message. US Central Command has provided transcripts of only the very first transmissions in December 2002. However, the content has developed over time, and new messages can be inserted at a short notice. "We're telling the Iraqi people for their own safety, to stay away from Baghdad International Airport," said Brigadier General Vincent Brooks at a Central Command briefing on April 6, two days after US forces had taken control of the airport. While this doesn't sound impressive in the era of 24-hour news television, it is an indication of increased flexibility in comparison with earlier radio propaganda operations. Current issues are mixed with messages that have remained the same throughout the operation. "We're also explaining the importance of carefully following checkpoint instructions as they approach them. There are checkpoints that they may encounter. If they follow the instructions of the people at the checkpoint, there are no problems," Brooks added. "We explain to the Iraqis the types of atrocities and criminal acts that the regime is responsible for. And we're also telling the Iraqi forces that remain, specifically the Special Republican Guard and special security forces, that they should surrender, flee, or fight and face certain destruction." A radio propaganda operation often precedes a war, and a war had indeed been planned for months. In December 2002, a hectic operation was underway 17 kilometers southwest from the Qatari capital Doha at Camp as-Sayliyah, which was being prepared to serve as the forward headquarters of the US Central Command (CENTCOM) in case of war against Iraq. However, a war had already begun - a war for the hearts and minds of the Iraqi people. For some time, US Special Operations Forces had been operating in and around Iraq preparing the ground for military action. An important part of the work was Psychological Operations (PSYOP). Officially, the purpose of PSYOP is to induce or reinforce attitudes and behaviors favorable to US objectives by conducting planned operations to convey selected information to various audiences in Iraq to influence their emotions, motives, reasoning and ultimately, the behavior of organizations, groups and individuals in Iraq. In short, if the Iraqi military could be convinced that resistance would be futile, the war would become less messy and it would be over sooner than without any psychological warfare. The most important field player in the PSYOP warfare is Commando Solo, the 193rd Special Operations Wing of the Pennsylvania Air National Guard. 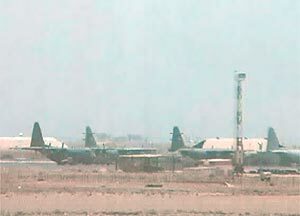 In November 2002 an EC-130E plane had been dispatched from its base at the Harrisburg International Airport in Middletown, Pennsylvania, to Qatar, to launch a radio propaganda operation against the regime of President Saddam Hussein. Qatar has gradually become the most important US ally in the Persian Gulf and a host of a few new military bases. Still, Qatar is eager to play down its vital role in the war against Iraq in order to maintain good relations with other Arab countries. The US is cooperating by keeping a low profile. American soldiers are confined to their bases to avoid fueling anti-American sentiment in the country. The largest US base is Al Udeid, built to host up to 10,000 troops and 120 aircraft, but Commando Solo is operating from a much smaller Camp Snoopy, which is located at the Doha International Airport just southeast of downtown Doha. US troops were first deployed to Doha in 1996, although construction work for Camp Snoopy really got underway in 2000. Although the US military has been silent about the location of Commando Solo, in fact not much effort has been made to conceal the aircraft from the eyes of the 5,000 daily passengers at the airport. Commando Solo, other US special operations aircraft and transport aircraft are not hidden in shelters, but are sitting on the tarmac close to the airport terminal, which is mostly used by Qatar Airways. The broadcasts became public in mid-December, when Pentagon announced the start of a new Commando Solo operation. 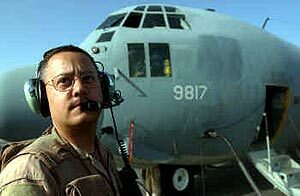 On December 12, 2002, an EC-130E aircraft of the Air Force 193rd Special Operations Wing began flying near Iraq. According to the US Defense Department, initially the plane was not flying in the Iraqi airspace, not even in the no-fly zones. From the start this psychological warfare operation included not only radio broadcasts but also leaflet drops, which actually started already on October 3, 2002. Both the radio broadcasts and the leaflets have been prepared by the 4th Psychological Operations Group (Airborne) at Fort Bragg, North Carolina, which is where the Army Special Operations Command is also located. Leaflet drops increased steadily, reaching 40 million on April 7, 2003. In comparison, during the Gulf War of 1991, a total of over 29 million copies of 38 different leaflets were dropped. The first leaflets contained messages urging the Iraqi military not to fire at US and British aircraft patrolling the southern no-fly zone. Later, leaflets have been dropped on Iraqi military forces encouraging them to capitulate, to refrain from using weapons of mass destruction and to leave oil wells intact. Leaflets dropped over population centers have told Iraqi civilians that Coalition forces are targeting the military. The leaflets encouraged civilians to stay at home and to listen to Coalition radio broadcasts. US Central Command has published images of most of the leaflets. The English versions of the leaflets are available only to feed the appetite of the western media, while all leaflets actually dropped in Iraq have been in Arabic, which is the native tongue for the majority of the Iraqi people. Leaflets have been dropped to Iraq since mid-December 2002, detailing broadcast times and frequencies of Information Radio. Leaflets have been dropped using various platforms from fixed-wing aircraft dropping fiberglass leaflet-bombs to UH-60 Blackhawk helicopters spreading the leaflets. The leaflets are not dropped by the Commando Solo aircraft, as often reported, but leaflets drops and radio broadcasts are separate operations. Thousands of wind-up radios have also been dropped from the air as well as handed out to the Iraqis on the ground to facilitate the reception of Coalition broadcasts. A key function of the leaflets has been to inform Iraqis of the frequencies used by Information Radio. From the start, Information Radio has been advertised to broadcast at 18.00 - 23.00 Iraq local time (equal to 1500-2000 UTC during the winter and 1400-1900 UTC from April 1, 2003) on five different frequencies, 693 and 756 kHz mediumwave, 9715 and 11292 kHz shortwave and 100.4 MHz FM. DXers and professional monitoring organizations were quick to spot broadcasts on 9715 kHz. Also 756 and 11292 kHz have been monitored, while other frequencies have not been confirmed by independent monitoring. 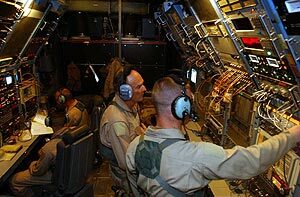 Although the reception of signals on the different frequencies varied greatly, it has been generally assumed that all transmissions have originated from several EC-130E Commando Solo aircraft deployed in the area. However, of a fleet of six aircraft, only one Commando Solo aircraft was being used at any given time, and it has broadcast on 693 kHz mediumwave, 9715 kHz shortwave and 100.4 MHz FM. The power on all of these three frequencies has been 10 kW. The aircraft used in the mission are rotated, but all have roughly the same transmitter facilities. In addition to the single Commando Solo aircraft, from the very start Information Radio has been transmitted also from other platforms. On the ground, HMMWV vehicles (High Mobility Multi-purpose Wheeled Vehicle, HMMWV), also known as Humvees or Hummers, are used by other PSYOP units as platforms for mobile transmitters broadcasting Information Radio. Humvees are designed for use over all types of roads, in all weather conditions and are very effective in the most difficult terrain, making them ideal for conditions in Iraq. 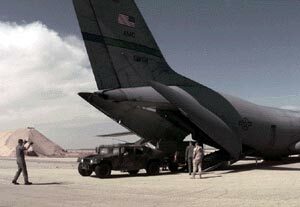 A Humvee drives out of a C-141B Starlifter (Photo by DoD). A SOMS-B unit can be transported also in one Hercules transport plane. In PSYOP, a system called SOMS-B (Special Operations Media System-B) has been used since 1997. SOMS-B is a combined radio and television broadcasting station packed in two Humvees and a trailer. SOMS-B units have been broadcasting Information Radio from the staging areas of US troops in Kuwait, and soon after the first Coalition ground troops entered Iraq, these mobile transmitters have been broadcasting from Iraq. The exact number of SOMS-B units is not revealed, however, it is more than one. Since mid-December 2002, SOMS-Bs have been broadcasting on 756 kHz mediumwave and 11292 kHz shortwave, both frequencies operated at 1 kW of power and transmitting 24 hours a day. SOMS-B consists of two subsystems, a Mobile Radio Broadcast System (MRBS) and a mobile TV Broadcast System (MTBS), but only the radio system has been used in Iraq. The MTBS can transmit television-quality video using PAL, SECAM (used by Iraq) or NTSC standards. The MRBS would be capable of broadcasting also on FM, although so far FM has not been used. Both subsystems consist of a primary shelter Humvee, a cargo shelter Humvee and a trailer. The trailer carries a 33 kW generator, an environmental control unit, and a tent system called the Deployable Rapid Assembly Shelter (DRASH). "The coalition continues to push information to the Iraqi population, and at this point we've now pushed our ground-based communications capability further forward by moving a ground base into Iraq. Up until this point in time, it was in neighboring countries," said Brigadier General Vincent Brooks at a Central Command briefing on March 31, in an apparent reference to SOMS-B. However, according to information received by DXing.info, SOMS-B was actually deployed in Iraq already several days earlier. In mid-February 2003, Information Radio transmissions were extended. "We're currently broadcasting on five different radio frequencies 24 hours a day and have been doing so since the 17th of February," said Brigadier General Vincent Brooks in a Central Command press briefing on March 25. However, it was not the five frequencies nor the 24-hour transmissions that were new. What Brooks failed to mention is that for the first time Coalition partners were involved - and that the extended transmissions originated from ships. Broadcasts began from coalition naval vessels patrolling in the Persian Gulf and the Gulf of Oman in the northern Arabian Sea. One ship at a time, primarily performing maritime interdiction missions, has been relaying Information Radio programming using whatever transmitters have been available on the particular ships, says Major Peter Mitchell, US Marines Public Affairs official at Central Command forward headquarters in Qatar. 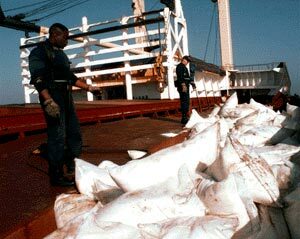 A maritime interdiction operation on an Iranian cargo ship (Photo by US Navy). Currently the ships are broadcasting only on 9715 kHz shortwave. Transmitter power depends on the ship in question. Broadcasts begin at 23.00 Baghdad time - when Commando Solo heads back to its base - and end at 18.00 Baghdad time, when Commando Solo once again begins its five-hour broadcast. Together these platforms make 9715 kHz available for 24 hours a day. Ships from at least three Coalition countries (US, UK and Australia) are rotated so that each ship transmits a few days at a time, before handing over responsibility to another ship. In late March 3-4 ships were rotating, but since the beginning of the naval transmissions in February, a total of 6-10 ships have been involved in the broadcasts. Coalition partners have been reluctant to identify the ships in question to maintain operational security. As far as the United Kingdom is concerned, there are three frigates (HMS Chatham, HMS Marlborough and HMS Richmond) and three destroyers (HMS Liverpool, HMS Edinburgh and HMS York) which could be involved. HMS Chatham has previously been reported operating as a platform for broadcasts to Iraq. Airborne broadcasts were doubled a few days after the war began. Interestingly, this move was never mentioned in the Central Command press briefings, although for instance the leaflet count has been updated repeatedly. One reason behind keeping a low profile could be that news about a second aircraft would have underlined just how small the Commando Solo resources initially were. The number of Commando Solo aircraft involved in Iraq has never been published in briefings or press releases by the Pentagon and CENTCOM. Around March 25, a second Commando Solo unit began support missions from the Doha Airport. This aircraft transmits on 693 kHz mediumwave, on 4500 kHz shortwave and on 101.4 MHz FM. The broadcast schedule is from 18.00 to 23.00 Baghdad time. In Europe, 4500 kHz is free from interference after 1800 UTC and gives a fairly strong signal, while the other frequencies have not been reported heard by anyone outside the US military. Leaflets including the new frequencies have not yet been published, but they exist and have already been dropped in the Northern and Western parts of Iraq, which is where the new Commando Solo operates. According to Mitchell, the second unit is temporary. "This won't be a permanent arrangement. For security reasons, I can't tell you how long two aircraft intend to operate in the Iraqi theater," he says. Officially, 683 kHz has been given as the mediumwave frequency for the second unit, and 690 kHz for the first, but as these split frequencies have never been reported heard by any DXer nor professional monitoring organization, both are likely typos. Only the crew members of Commando Solo would know the truth, but they were unavailable for comment. "My understanding is that we're getting the Iraqis close enough to the actual frequency that they're easily picking up the signal. I'm unaware of the specifics of what hobbyists are reporting. I do know that we have ample evidence that the signal is being received and that Iraqis are tuning in," Mitchell says. The different platforms are operated independently by different PSYOP units, but all share the same programming material. Although they have been observed with different program feeds, this is not an indication of different content, but is only due to different timing of specific programs, Mitchell explains. By late March, Commando Solo aircraft were able to fly not only in Southern Iraq, but practically all over the country. However, despite the improved output and reach, some have expressed doubts about the effect of these transmissions. Iraqi resistance has been tougher than expected and much fewer troops have surrendered than anticipated before the war. While the true impact of Information Radio will not be revealed before the war is over, officials at CENTCOM are confident that PSYOP is working well. "Listenership is currently determined using intelligence sources. 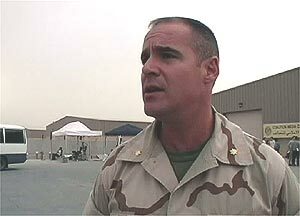 Accordingly, I cannot reveal what we believe the listenership to be until such time that Iraq is secure and we can do actual polling after the fact," says Major Peter Mitchell. At least the Iraqi leadership has reacted to the broadcasts. Before the war began, President Saddam Hussein himself sought to ridicule the operation by making fun of leaflets as weapons. 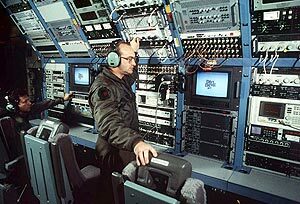 An Air Force crew member adjusts the output of a transmission during an EC-130E Commando Solo II training mission (Photo by USAF). 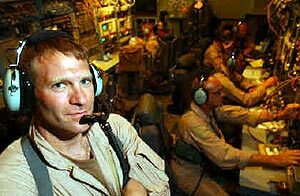 In an interview with US Central Command, Air Force Lt. Col. "Mike," a Commando Solo II detachment commander, said that "We call ourselves weapons of mass persuasion". When the war had lasted for two weeks, evidence was mounting that these weapons of mass persuasion have resulted if not in mass surrenders, at least in mass desertions. Not all of this has been achieved by only leaflets and radio broadcasts combined with traditional warfare; PSYOP tools also include email campaigns, telephone calls, messengers and TV transmissions, which were begun by Commando Solo in late March. This was announced by Brigadier General Vincent Brooks on March 28. PSYOP units also use loudspeakers to reach enemy troops up to a distance of nearly 2 kilometers. There are also weapons of mass persuasion which the Coalition does not admit having. Clandestine radio operations such as Voice of Iraqi Liberation, discovered first by DXing.info, and Radio Tikrit (see article: Monitoring Iraq: War of the Airwaves) broadcast practically the same message as Information Radio, but are presumably run by the US intelligence community. All together, the US has launched the broadest and the most sophisticated psychological warfare operation in modern history to oust Saddam Hussein. "Nice job on your article! It is the most accurate, most thorough article I've EVER seen on my unit - and that's saying a lot with the press we've been receiving lately"
Would you like to comment on the article or ask a question? Join the discussion on the DXing.info Community Asia Forum. Comments and corrections are welcome also by email. "The most accurate, most thorough article I've EVER seen on my unit"